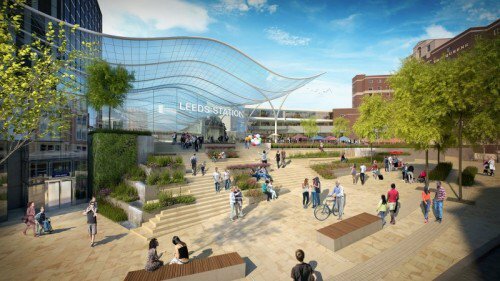 A milestone in the preparations to bring HS2 high speed rail into the region has been reached as senior councillors today endorsed the detailed case for transformational plans for Leeds Station. Leeds City Council executive board heard how it is imperative to have a fully-integrated, modern station in Leeds – already the North’s busiest – in order to maximise the potential of high speed rail. The HS2 route is due to approach the station through Hunslet using the Woodlesford route and then rise on a viaduct from the city end of Dewsbury Road, finally bridging across the River Aire. Councillors on the board approved the submission to government of the strategic outline business case (SOBC), which details the approach to how the station masterplan will be delivered. They also agreed in principle that the council enter into joint venture agreements with London and Continental Railways (L&CR) to use their expertise on railway-led regeneration, subject to a further report being brought back for approval. “This is an incredibly important milestone in what will be nothing less than a transformational opportunity for the Leeds economy and that of the wider region. Our asks to government for the station are absolutely pivotal to unleashing the potential for HS2 to bring jobs, growth and hugely improved connectivity to the area. “Leeds Station is the key to the North’s future economic growth: central to accessing the whole of the North of England and Scotland. It is the busiest transport hub in the North with 31 million passengers, and those numbers are projected to more than double by over 135% over the next 30 years. The executive board was also asked to note progress on the HS2 Growth Strategy, preparations for the Hybrid Bill and work on the South Bank Leeds Regeneration Framework. It comes on the same day Network Rail have announced improvements to the station’s existing roof. A connected place that seamlessly integrates national, regional and local transport. The full report, Update on the HS2 Growth Strategy, HS2 and Leeds Integrated Station Masterplan can be found here (click on agenda item 11).